Years ago, I began exploring design in nature and pressing many flowers, mostly dissecting them for their basic components of petals, stamen, pistil, and sepal. Once pressed, I used them to create designs—mandalas mostly—framing them and sometimes selling. I also pressed leaves of many shapes. Basically, I was exploring the infinite diversity of shape and form in nature, a rather mind-boggling adventure to be sure! As I continued to explore, I discovered a petal design, which most serious gardeners know; I was thrilled to see rose petals with heart shapes! Even the multiflora rose, an invasive brought over from the British Isles, has wonderfully shaped hearts. So, I began seriously collecting and pressing hearts from them, and many other rose bushes, to incorporate in my mandalas. I also discovered little bird shapes in locust and red bud flowers, as well as the white and yellow sweet clovers, which grow here on my property. These, I sometimes added to my meadow scenes. It was my heartfelt craft. Recently, while reading Dr. Rachel Remen’s book about healing, I learned that the rose “is one of the oldest archetypical symbols for the heart…appearing in many Christian and Hindu traditions and in many fairy tales.” Learning this greatly inspired me, so for Valentine’s Day I am sharing with you some of her deeper understandings, for who does not love hearts? As children, many of us enjoyed creating special hearts for others out of red and pink paper, sometimes decorating them creatively with glitter and frills around the edges. Some people may still do this with heartfelt love. I find this affinity for hearts and roses very intriguing and deeply symbolic, not sappy. Dr. Remen, besides being a compassionate, spiritual therapist for people in their last days of cancer, has also had an illness of her own that she has lived with all of her life: Crohn’s disease. In her short essays, she sprinkles stories of her own suffering in small doses, but mostly focuses on the stories of others. One of her clients, being treated for ovarian cancer, said that she had no heart, and that her amazing success in business was a direct result of her ruthlessness. As her client’s therapy continued, she began to speak of her traumatic time as a young child during the Vietnam War and how she saw her family ruthlessly killed. She became homeless, was brutalized herself, even killed others to survive, leaving her filled with hate. She proclaimed herself to be a bad person—selfish and unloving—with nothing but darkness in herself, and she was despairing because of this. This was a part of herself she had kept safe, hidden even from herself, said Dr. Remen. Perhaps, this was even a rose in the garden she remembers from her life before the war blew it apart. The rose was symbolic of a part of her that had never been touched, pure and unscathed by terror. All of us have that rose with heart-shaped petals in our lives, in our gardens or in our own hearts. The Earth itself is filled with wonderful healing flowers and is, in fact, the heart of our hearts. Without Earth’s purity, we will die from fear, distress, and abuse; and we will take the Earth with us, unless we recover our hearts. Personally, I have had a love affair with the natural world since I was a little girl and feel profoundly blessed to have survived my trials and not lost heart. So, if you are cynical about the heart shape that appears everywhere on Valentine’s Day, maybe this year try looking at it differently, perhaps even picking up a rose and discovering its heart shaped petals. 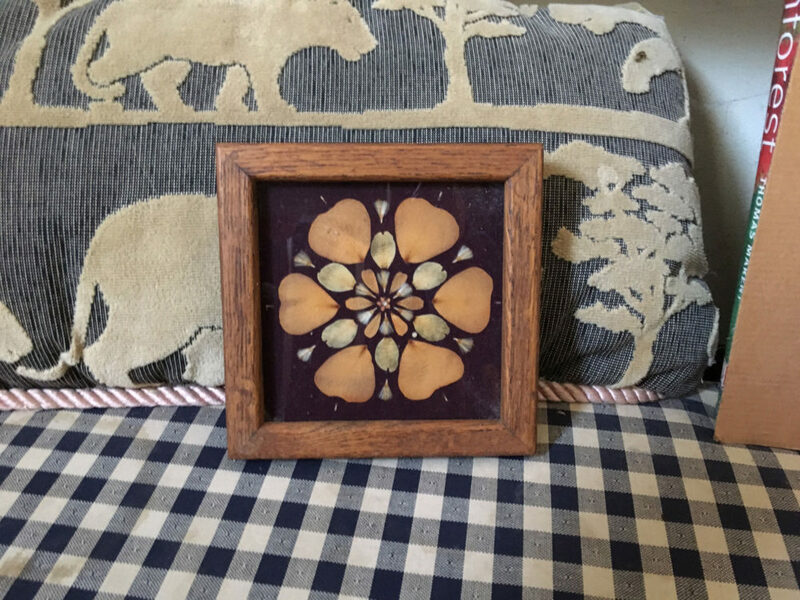 Pressed Flora Mandala with rose petals.